In keeping with Joe’s recent post on using primary sources to teach, I think it would be appropriate to highlight what the show did with Frederick Douglass this week. Most PBS documentaries these days do something to dramatize the words of historical figures. Many, like Ken Burns’s iconic series on the Civil War, employ voiceover actors to read primary sources (especially personal letters and diaries) in character. Others get more creative; Liberty! The American Revolution had costumed historical reenactors actually stare into the camera, talking-head-style, to recite from historic texts. There was something more than a little unnerving about that approach, but it was effective. The Abolitionists takes an approach I found much less powerful. It has Richard Brooks, the actor playing Frederick Douglass, read lines from the Narrative of the Life of Frederick Douglass in a staged scene–as if Douglass had spoken those words extemporaneously at an antislavery meeting in Nantucket instead of writing them down. What bothers me about this isn’t simply the transposition of words to a new setting. I’m annoyed, I think, because the film immediately moves on, depicting a private conversation between Douglass and William Lloyd Garrison, in which the two actors speak (as far as I know) wholly fictional lines. The effect is to diminish the power of Douglass’s own real words. In contrast, when actors speak in more conventional documentaries, their words carry empathetic power precisely because we know, or at least assume, their script is accurate to words the real historical figures once wrote. And perhaps this is also because the conventional framing is much more intimate than The Abolitionists’ docudramatic presentation; to hear a single voice speak the words of a nineteenth-century letter or book conveys the personal nature of epistolary communication in a way this film’s crowded reenactments don’t. I’m not sure whether that suggests anything really useful about how we should use primary sources in a classroom. I think it may, though. If nothing else, it may imply that it’s important for us to think about preserving the “texture” of a text as a personal document when presenting it in a public setting. In other respects as well, The Abolitionists is still struggling to reconcile its biographical approach with its mass-movement subject matter. Thanks to Frederick Douglass, Part 2 does at least have a strong black abolitionist character, which helps make up for Part 1’s total lack of attention to early-republic black activists like Richard Allen, Lemuel Haynes, William Hamilton, Samuel Cornish, and David Walker. And the film is now trying harder to explain the abolition movement’s place in a national public sphere by discussing the Mexican War and the Compromise of 1850. But the documentary still struggles to connect individual motivations to wider communities and belief structures. This episode’s analytic problems culminate in an insufficient discussion of the break between Garrison and Douglass, which it treats entirely as a clash of egos, and in a highly awkward portrayal of Harriet Beecher Stowe’s decision to write Uncle Tom’s Cabin. We are led to believe that Stowe decided to write against slavery because her son died of cholera; we are not given any help connecting the dots between those two concepts, aside from some brief handwaving about Calvinism. Though there is always difficulty in creating fictional dialogue for historical documentaries, I still think, as with last week, that the strength of this series lies in the vividness of the portrayals of the individual abolitionists themselves. Garrison, to me, has been a captivating character – we know him as a man with a fiery abolitionist passion, but the re-enactment scenes shows that there is a pleasure in his achievements that gives a much more believable, human side to his dedication. Similarly, I found the transformation in Douglass’s character through this week’s episode convincing, and helpful – showing the development from a fugitive slave fearful of recapture at any moment to a strident, forceful, powerful voice against the horrors of slavery. This dovetailed nicely with the political story that developed in the background, with the nation beginning to move towards a crisis point in the mid-1850s. Given how briefly Harriet Beecher Stowe and John Brown appeared this week, I will be fascinated to see the ways in which their characters are developed in the series finale. That said, the scenes that the directors have chosen to dramatize seem to be bizarre. Why were there so many voiceovers interrupting the flow of Garrison and Douglass speaking at anti-slavery and abolitionist meetings? 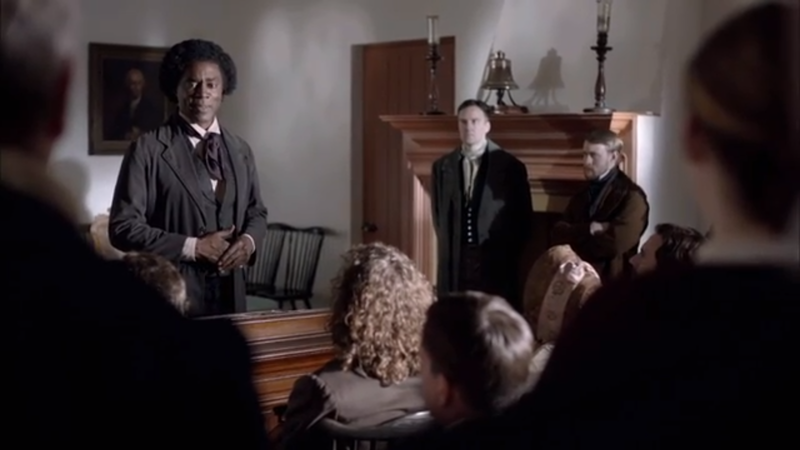 I know that 19th century speechmaking is too verbose for modern TV sensibilities, but given how compelling I have found the acting in the series, I have found myself wanting to see more of how Douglass could win over a crowd. Take the first appearance of Douglass in front of a crowd, for example. Why not let him speak for himself, rather than flashback to the scene of a slave beating depicted in the first episode? In the same way that the documentary claims that Uncle Tom’s Cabin touched the heartstrings of reluctant opponents of slavery in the North, so a fuller reconstruction of popular meetings could have given much more color to the depiction of the abolitionist movement. Of course, the notion of an abolitionist movement is largely absent from the documentary, given its direct focus on five main characters. That weakens the power of its historical analysis. A 60,000 signature petition rolled into the Massachusetts State House like barrels was designed to be a memorable public spectacle – why was this not chosen for re-enactment? It would have been a perfect visual demonstration of the growing weight of the abolitionist movement in the 1840s. This would have undercut the notion that the directors were setting up – that speeches alone could not abolish slavery. But the movement towards getting people to have some sort of personal stake in calling for the abolition of slavery was crucial. Personal liberty laws in the north were a crucial shot fired across the bows of slavery in the South, and showing how the activism of Garrison and Douglass had a direct relationship with these steps would serve the valuable purpose of showing the practical effects of calls for abolitionism. That said, until we reached 1850, politics was strangely absent from this episode. Unless I missed it, there was no mention of either the Liberty or Free Soil parties in the 1840/1848 elections. I don’t recall hearing any mention of the Wilmot Proviso, either. The documentary did a very good job of showing how slavery became bound up with politics and federal power after 1850; but its appearance was all rather sudden. Perhaps it makes for a more dramatic story, but it sells short the ordinary activism inspired by The Liberator or the North Star. And what of poor John Quincy Adams and his advocacy in the House of Representatives? Finally, there still hasn’t been an adequate explanation of other strains of anti-slavery thought outside of abolitionism; nor has there been an adequate explanation of the ideology of paternalism. That causes great problems in the narrative the documentary is trying to portray. One of the reasons that a supposedly Christian nation has failed to see slavery as a moral wrong prior to the 1850s is that many believed that slavery wasn’t incompatible with Christian behavior. Nor were people suddenly converted to the cause of anti-slavery in the early 1850s, as the documentary seemed to suggest at the very end – instead, an issue they thought would either die out naturally, or that could only be dealt with on a gradual basis, suddenly became a pressing imperative. Yet without that full picture of the world in which the abolitionists operated, the real impact of their achievements will remain obscured. I hadn’t realized it before but I hold higher standards for academic books on history than history as it’s represented at the movies or comparable docudramas on television. I suppose it’s because an academic book has a bibliography and generally has footnotes and is presented as fact, at least as close to fact as the author believes can be achieved. consequently, my expectations are lower and my suspicion that literary license is in play greater. In addition, its easy access makes a television program more available to the public and therefore the desire to make the subject matter more digestible is greater. So this is all preamble to the question, is this a valid observation and if so, should this change how the program is critically viewed? I should also admit that I view programs like “The Abolitionists” as an oasis in a vast desert. Paul, thanks a lot for your comment. I suppose I should make it clear that I’ve enjoyed the series so far, and that many of my comments here come from the angle of how I, as an academic, can teach using these sorts of documentaries. Students often ask about being able to watch documentaries in class – and I have found them a very useful aid in kick-starting discussion. The sense I’ve had so far is that it would be quite long – certainly I’d need something explaining the slave South, in the way that cotton transformed the South and in explaining the (supposedly) Christian doctrine of paternalism. I’d need to explain the development of abolitionism and anti-slavery as a mass movement, and I’d need to explain that abolitionism and anti-slavery were not synonymous or coterminous. I’d also need to fill in some of the political background. Some of that is natural – especially for a documentary that spans about three decades. But I get the sense that it’s too much for me to be able to use the documentary in class. Especially as that doesn’t even account for the amount of time spent discussing how accurate the portrayal of the individual characters was. That makes me sound more negative about the documentary than I really am – it has been entertaining and there haven’t been egregious errors. My complaints are more about omission. But they are also about framing. Could I use episode 2 as an interpretation of Douglass’s life? Yes, I could. But I couldn’t use the series as a whole in the same way. I hope that gives you some idea of how to approach these series more critically. I’d be interested to know if you had the suggestion of any alternative standard I could use? I must admit I approach the idea of documentaries and docudramas with a bit of trepidation (especially with respect to antiquity and, particularly, Rome). Not that I don’t see the value in using even popular films like Gladiator as a means of discussing the ‘history’ in them as an interpretation of Rome but I do have to be very careful in how I show them and how I ask my students to use them. Yet, what surprises me most is that my students are often the most critical of documentaries, docudramas, and popular film representations. Indeed, I have seen that many are even more critical than I am and it can lead to fruitful discussions about our primary source readings for that week. It may not always be good criticism but it is a means for me to break the ice about ancient ideas/readings which many may not get in high school and may never see again after my class. The aspect that most worried me about the PBS Abolitionist series was its assumption that the abolition movement was Made in America, and owed nothing worth mentioning to the outside world. At the end of section 3, an unidentified voice (probably that of the actor playing Frederick Douglass) said in effect that where the US had blazed the trail to freedom from slavery, others would follow. In real life (and real history, of course), it was in fact the US that followed the trail others had blazed. Both our neighbors (Mexico and Canada) had abolished slavery long before we did, as had a number of other countries. Probably the most influential example for American abolitionists came from Great Britain, which did away with the slave trade in 1807, and abolished slavery in its colonies (meaning primarily the West Indian sugar islands) in 1834. And there was, of course, the Russian abolition of serfdom in 1862. But you’d never know any of this from PBS. Seeing the US as the inventor of abolitionism reminded me of those old Soviet claims that Russia had first discovered electricity, and had invented such modern good things as the airplane and even (!) baseball (which in fact we know was also recorded by Jane Austen).